The Best Garden Tour of the Year is Ready for a Repeat! Our 19th Pond-O-Rama tour will be from 9 a.m. to 5 p.m. on Saturday, June 22 and Sunday, June 23, 2019! 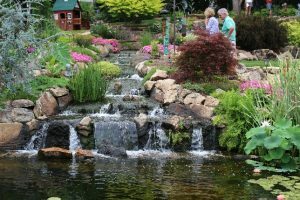 For the past 18 years, the members of the St. Louis Water Garden Society have shared some amazing water features and gardens during this annual two-day event. It attracts more media attention than ever, helping to introduce water gardening to the public and enlarging the Society through a free trial membership offer to ticket holders. Our hosts and Pond-O-Rama committee members in addition to the advertisers, retail ticket sellers and ticket buyers are the wonderful people who make this event successful each year. Last year, just about every host felt that the visitors were the most fun whether talking with those who want a pond and sharing information and ideas, or helping to solve problems; and, of course, seeing how much visitors enjoyed seeing the homeowners’ special spots. Can you help? Can you be a host this year? Share your beautiful space. Every water feature is different and interesting. Click here to fill in the online Pond-O-Rama 2019 Host Form and be part of this year’s exciting tour! Or do you want to select host gifts? Run tickets to the retailers? Organize the host party? Sign up advertisers? Write up ponds for newspapers and magazines? Email Joan Ziskind to be on the Pond-O-Rama committee. Looking forward to seeing you on March 19th at 7:00 PM, Missouri Botanical Garden, Beaumont Room for exciting information on those darling little birds! Have you ever wondered about the meaning of hummingbirds? Hummingbirds have a long history of folklore and symbolism in native cultures. In Native American culture, hummingbirds are seen as healers and bringers of love, good luck and joy. In Central America, they are a sign of love and will bring love to the person who spots them. What better topic for February than one on Hummingbirds!. Our speaker for the March 19th meeting is Angela McDonnell, owner of Wildbirds Unlimited in Florissant, MO. She will share her knowledge of hummingbirds and many of the birds that enjoy our water features during the year! Share your beautiful water gardens……host information is due March 15, 2019. Click on the online host form and forward to Joan Ziskind. Advertisers …… Space is still available in our Pond-O-Rama ticket books! knowledge with our members and the public. at 7:00 pm at the Missouri Botanical Garden, Beaumont Room. or wear in the garden………… for the APRIL MEETING AND AUCTION!!!! Great fun, food, and surprises! We’d love to hear from you. If you have a quick question or if you just want to say hi. For any inquiries feel free to use the contact form to the right. If you would like to touch base with any of our board members directly you can visit them here. We can’t wait to hear from you soon!